Pontiac Street Performance - B body project's ?? anyone fixen up their B bodies lately ?? I got the front end done along with 1" drop springs from OPG (wish i got the 3" but oh well) along with new rear upper & lower trailing arm's from PMT !! Cleaned & painted axle arm brackets & with housing and brake baking plates next !! after the front end was done what an improvement in handling but have not tried out the rear arms yet but sure it will be even better!! more than likely i will not have a sway bar made but ya never know !! the two co,s mentioned are great to work with & lots of early B body parts !! i might order the 3" drop springs & sell my 1" if anyone is interested !! this spring !! they are almost settled back to org. ride height but would like frt. lower than before being the new 16" wheels & tire's set frt up more !!! Hey mike, I've had my projects in mothball. im starting back into my '63 GP soon. I'd like to shore up the front end before it goes back on the road so I'm always reading about suspension endeavors with similar cars. Great work on your rig. i am with you on keeping up, always something new !! sure glad my other Pontiac bud found PMT site for me, the guy doing a resto on his '58 Impala wanted $500. to box just my lower arms !! no bushings or paint !! all 4 from PMT poly & powdercoated $376. what a deal !!! keep your progress posted !! decided to clean & paint axle housing & pumpkin, tail pipes from SS tips to mufflers, frame rails from bumper to front of rear tire, my buddy said it sure looks pretty going down the road while following to S&S,painful to to body but well with the effort !! new springs shocks & T-arms it handles & corner's better than ever !! maybe body mounts next with help from our members with advice & a time frame !!! Mike--what paint did you apply on the axle? What did you do to prep it for paint aside from washing it. I have to do the same; or should do it on the TA. There never was much paint on it. I think it was dipped in something to keep it from rusting--it doesn't look like paint. Bill i used wire brushes with air die grinder sand paper SS tooth brush & cleaned with gas which cleaned dirt & oil of very food then Fantastic, finally Dupli-color prep cleaner ! paint 2 coats of dupl- color etching primer & 3 coats of 500 deg. ceramic engine paint! lot of work but well worth outcome ! i will e mail pics to you !! the gas was the key it cut all the crap off when nothing else worked !!! Thanks, Mike. I looked at the photo you sent and will post it later today. It does look great and shows that meticulous and thorough preparation provides a solid foundation for a nice looking finish. Great job. one thing i forgot to mention being i do not have a lift i put front end on ramps & got rear up higher than ft. end, made wood blocks 4" tall along with X big stands to get high enough, remove shocks for more room & so housing hangs low, being my new arms are powder coated to protect them i used rubber Vac. tubing slit & slid on bracket for the T-arms will lay on brackets when housing is let down, using bottle jack centered under axle to control drop, once free hanging very easy isolate other areas not to be painted !! sorry for the long post but all this made it so much easier !! Mike, I understand the jacking up higher than normal, securing it all so that it can be worked on--laying on your back. Not only that, doing all of that stuff at our age with little or no extra help. It's a lot of work and quite tiring to boot. Your car is a show piece though and a successful won as well. The extra effort shows. 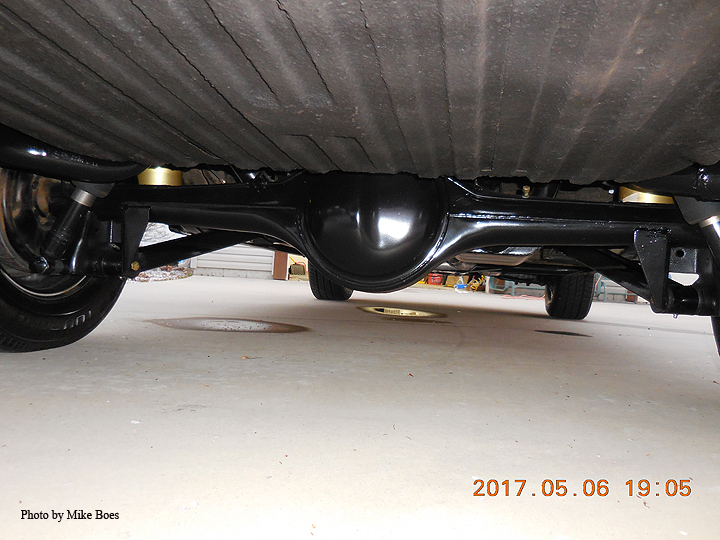 Mike, below is the photo you sent me earlier to post for you showing the Bonnie's axle etc. Nicely done. sure you will get it done but one thing i regret was not using gas to clean in the beginning, job would have been way faster, then touch up with sanding rough spot's !! just make sure area is open air ! before painting cover everything you don't want over spray on especially the body !! just received my rebuild kit from Fabcraft very nice .front end kit from PST not so much....rear end should turn out nice and thanks for tip on the gas. Mike, the gas worked great on the car and lots of elbow grease and a putty knife. Thanks again..
glad it worked out for you ! I found PST to be high priced, I bought all 4 of my rear control arms from http://pmtfabrication.com/product-category/pontiac-2 $379. great people to work with ! i seen a while back they have add a lot more suspension parts to inv. haven't looked lately will be changing front sway bar in near future, so back to their sight i go !! with new bars in rear i found no need for rear sway bar now being cornering is much improved ! !